The Communications and Multimedia Minister Gobind Singh Deo revealed yesterday that Maxis is the main sponsor of 2018 FIFA World Cup on Radio Televisyen Malaysia (RTM). The government has clarified that the cost of airing 41 of the 64 FIFA World Cup 2018 matches from Russia over RTM would cost RM30 million, and not RM40 million as earlier reported. The Minister did not reveal the other sponsors involved, but several sources told Malay Mail that low-cost carrier AirAsia Bhd is also one of the sponsors. “All I can say for now, because many people have been pushing me to reveal, is that Maxis is the main sponsor. “As for the rest of them, how many sponsors we have, and the amount sponsored, will be revealed on Tuesday,” he said, referring to a special press conference next week on the FIFA World Cup telecast. Gobind added his ministry has instructed RTM to sort out the details with the license holder, in an attempt to add more live televised matches to their program. At the moment, a total of 41 matches would be aired, of which 27 would be shown live on RTM. “As of now we have 41 matches, but at the same time I have ordered RTM to try and negotiate more matches and ways even on improving the pricing,” he elaborated. Last month, Malaysia Finance Minister Lim Guan Eng said the government agreed to broadcast the FIFA World Cup matches because it is only held once every four years. Speculation on who the main sponsors were surfaced following Finance Minister Lim Guan Eng’s statement recently that the full RM30 million needed to televised the competition had already been obtained. It is understood that AirAsia Group CEO Tan Sri Tony Fernandes made the gesture following his admission last month that he had succumbed to political pressure in his support for Barisan Nasional during the election, Malay Mail reported. However the newspaper could not get AirAsia for a response on its involvement. RTM has been broadcasting (free-to-air) FIFA World Cup matches in Malaysia since 1974, however not all matches are broadcasted live. 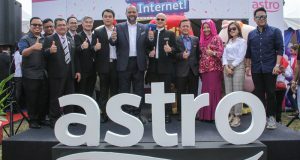 Satellite pay-TV operator, Astro is currently the only TV network with broadcasting rights to show all World Cup matches ‘live’ in Malaysia. The media rights to show the World Cup in Malaysia have been held by M-League Marketing Sdn Bhd since 2002, which then licenses it to Astro giving the pay-TV operator the rights to broadcast on TV, mobile and Internet. The 2018 FIFA World Cup is set to kick off in Russia on June 14 across 12 venues in 11 cities. The final match of the International football tournament will take place on 15 July at the Luzhniki Stadium in Moscow.